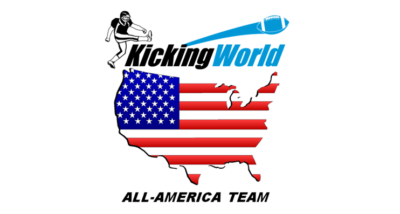 On August 3-4, 2013 Kicking World and EuroKickers set history. The 2 instructional kicking companies joined forces and held the first ever American football kicking camp in Italy. Coach Christoph Kipperer from EuroKickers (Graz, Austria) and Coach Brent Grablachoff from Kicking World (San Diego, California) united to provide opportunity for aspiring European football kickers and punters who up until this weekend, knew very little about kicking in America. Brent Grablachoff flew out from the US to meet Christoph in his hometown of Graz, Austria. The pair evaluated 15 specialists who attended the camp in Bolzano, Italy that came to learn and improve their field goal, kickoff and punting skills; and showcase their talents for potential visibility into college football programs. The students came from Italy, Austria and Hungary and all play in European football leagues in their home areas. For most campers, they never had instruction like this before as guidance and fundamental instruction for kickers is very limited outside of the US. Coach Christoph received a scholarship in college and played at Division 1 Mississippi Valley State, so he’s well aware of the college recruiting process for a European footballer. Coach Brent helped place over 15 specialists into colleges last year on partial or full football scholarships so he was able to evaluate the talent in Europe and help provide guidance for the campers. Hits a great field goal – excellent trajectory, lift and carry. Another notable from camp is Matteo Lanteri from the Castelfranco Cavaliers in Italy who improved nicely over the 2 days. He put a nice streak together with field goals back to 45 yards and showed D3 level kicking ability. He decided to walk on to Division 3 college football school, Becker College in Massachusetts this summer! Based on the success of the first ever American Football kicking camp in Italy, Coach Christoph Kipperer and Coach Brent Grablachoff are already planning their second camp in Europe. The pair hope to hold a second American Football kicking camp in Bolzano Italy again in 2014. EuroKickers already holds kicking clinics in Austria and surrounding countries, but this will be a unique arrangement for the two to continue to join forces and provide opportunity for more specialists across Europe. Follow the Kicking World and EuroKickers websites for details to come on future kicking camps in Europe.